I was first introduced to fine handwork while living in Germany as a youngster with my family. Coming from a military family, we were taught how to use our imagination to keep us busy, no TV, no cell phones or electronic devices. We moved a lot so our friends were each other. We learned how to pass the time with theater, taught by my mother. The art of painting on canvas was “not my thing”, but two of my siblings went in that direction. Sewing and needlework was taught by my grandmother from darning socks to smocking dresses by hand. Little did I know how all this would become part of my life to create and pass on to generations as my mother and grandmother passed it onto me and my siblings. I began with Girl Scouts, teaching young girls about the arts and crafts and the changing world of women and working outside the home. In 1988 I opened a cross stitch shop with custom framing that specialized in the framing and conservation of needlework. I have had the pleasure over the years to work with several museums and have reproduced samplers from some of the collections. I created Celebration of Needlework in collaboration with nine other shop owners in 1992 and continue to run this show in Nashua, NH. 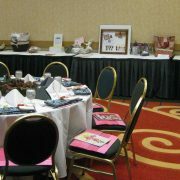 We have a breast cancer fund event every year that has raised thousands of dollars for a cure. I began my very first retreat in Nantucket, MA in 1992 with 150 women attending — not knowing a thing about a retreat. Some of these teachers are still in the industry and continue to teach for me at Celebration. Celebration is all about bringing designers to you and giving that new designer the opportunity to grow. When I look back over 25+ year’s, Celebration of Needlework has done just that!